Chameleon has announced a small transmitting loop, the Chameleon CHA M-LOOP. All information on this product and the product itself is the property of and is proprietary to Chameleon Antenna. This is a clear attempt to suppress analysis and discussion of the technical aspects of the antenna which is based on the work of others. They are not alone in attempting this, and as a buyer you might ask what have they to hide. Though entitled to quote under fair use terms of copyright law, I will refrain from creating the basis for argument with a company that sets out to constrain discussion of their product… you can find the referenced graphs and tables in the references below. The antenna is described at (Chameleon 2014a). The loop itself is 1″ (25.4mm) diameter aluminium tube in a circle of 36″ (0.914m) diameter. The matching circuit is the Patterson arrangement according to their web page. The coupling of the antenna is achieved with multiple variable capacitors and use a capacitive voltage divider technique developed for the Patterson Loop (Army-Loop) in 1960’s. In other word, no Faraday coupling loop is needed to play with in order to bring the M-LOOP to great resonance. The Patterson circuit is commonly shown in two forms in ham articles, one is inconvenient to build (and probably the actual Patterson circuit), and the other more convenient though perhaps less efficient. 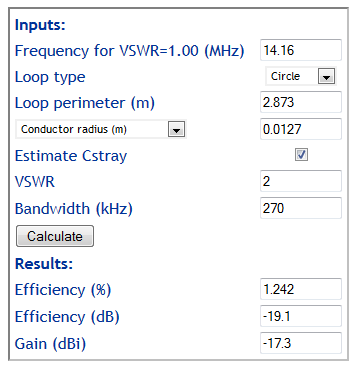 At (Chameleon 2014a), measured VSWR curves are given for various bands and extracts from (Yates 2009) Small Magnetic Loop Antenna Calculator ver. 1.22a. The interesting inconsistency is that for example, at 14MHz, Yates calculator shows a half power bandwidth of 15.731kHz wheras the measured VSWR curve suggests more like 380kHz for VSWR=2.6 bandwdith, equivalent to half power bandwidth. 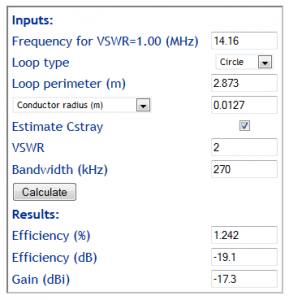 The measured VSWR bandwidth is almost 25 times the calculator prediction, which implies that the calculator’s prediction of efficiency is a gross overestimate. There is something radically different between the calculator model and that actual antenna that was measured. (Duffy 2014) discusses failures in Yates calculator, and additional to those, in this instance the assumption of copper conductors and exclusion of matching network losses are significant. Working back from the measured bandwidth, we can get an estimate of efficiency using Efficiency and gain of Small Transmitting Loops (STL). The estimated efficiency is some 17dB less than Yates’ estimate, ie 1/50th or 2% of the estimated efficiency. It will be interesting to see measurements made by owners. There is nothing magic about wide bandwidth in a small transmitting loop, it is a sign of low efficiency, and measured bandwidth is one of the simplest verifications / reconciliations of loop design. Next Next post: The KISS TNC – too simple, too stupid?